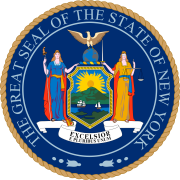 The 1816 New York gubernatorial election was held in April 1816 to elect the Governor and Lieutenant Governor of New York. Governor Tompkins had received the nomination of the Congressional Caucus for Vice President as James Monroe's running-mate. Senator King would receive the votes for President of those Federalist Electors chosen that fall.